From having your date arrested to listening to your Valentine wish he was out with your mother, the stories of bad Valentine’s Day dates are far too plentiful. 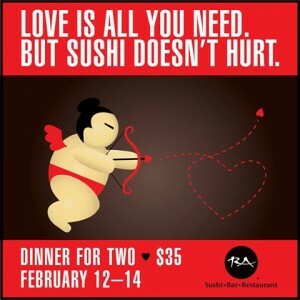 That’s why RA Sushi, the restaurant known for its creative sushi and inventive cocktails, is hosting an online group therapy session for victims of bad Valentine’s Day dates. These casualties of love gone wrong can share their tragic tales using the hashtag #LoveRebootAtRA on Facebook, Twitter and Instagram and commiserate with fellow suffering sweethearts. • Pork Gyoza bears sizzle-and-sear sautéed Asian potstickers served with a citrusy ponzu sauce. • Tootsy Maki rolls together creamy crab mix, savory shrimp and refreshing cucumber before being topped with crunchy tempura bits and drizzled with sweet eel sauce. • Garlic Ponzu Yellowtail marries thinly sliced yellowtail with a tangy garlic ponzu sauce and scallions, and is served with organic micro greens. • Chicken Teriyaki partners juicy sautéed chicken on a bed of steamed rice and Asian vegetables. • Cinnamon Tempura Gelato is a flash-fried lightly battered cinnamon-swirl gelato that’s finished with a tantalizing blend of raspberry and chocolate sauces. • Coconut Crème Brulee is a melt-in-your-mouth creamy concoction of decadent coconut and vanilla flavors. “Japanese dishes are among the sexiest foods in the world. Every dish our chefs have created is a coupling of unique tastes and textures that leave diners’ taste buds begging for more,” said Michael Johnson, vice president of operations at RA Sushi. The Valentine’s Day menu is available at RA locations in Arizona, California, Florida, Illinois, Kansas, Maryland, Nevada and Texas. Reservations are strongly recommended, and hours and contact information is available by visiting RASushi.com. RA opened its first location in Scottsdale, Ariz., in 1997 and has since expanded to 28 restaurants in 13 markets, including Arizona (Phoenix-Ahwatukee, Mesa, North Scottsdale, South Scottsdale, Tempe and Tucson); California (Chino Hills, Corona, Marina Del Rey, San Diego, Torrance and Tustin); Florida (Orlando, Pembroke Pines and South Miami); Georgia (Atlanta); Illinois (Chicago, Glenview and Lombard); Kansas (Leawood); Maryland (Baltimore); Nevada (Las Vegas); and Texas (one Austin, three Dallas and two Houston locations). Look for RA on Facebook, Instagram, Twitter, and Pinterest, and check in at RA Sushi on Foursquare. For information, visit www.RAsushi.com.